For many people, being able to retire seems impossible. But these 11 people can help you save enough to quit. PHILADELPHIA (TheStreet) -- The idea of retirement is scary to many, especially those without a traditional pension. But at last week's Bogleheads meeting -- which gathered 250 fans of Jack Bogle, founder of low-cost index-fund-focused mutual fund company Vanguard -- investors focused on how to make it to retirement. Retirement is possible, said the consensus. Not easy, but possible. Here's advice from 11 mutual fund managers, authors, financial advisors and ordinary people about how you can save enough to quit. 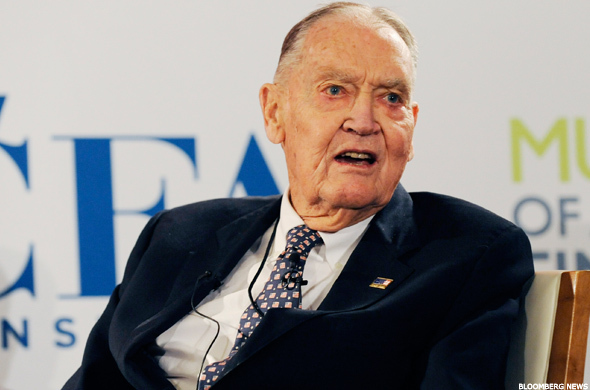 Jack Bogle, the founder and retired CEO of Vanguard, offered his advice in a phone interview. "When you start investing -- when you've never invested before -- one, [you need the] habit of discipline is to save regularly," he said. "Number two," of your first $500 investment, "put it in an index fund, an all-stock index fund.... The most you can lose is $250, assuming a 50% decline." "Put your money away through thick and thin," he advised. If the market looks bad and you're waiting until things get better -- "don't." Invest through the good times and bad. Don't change course, he said. More importantly, "don't worry about it, pay no attention to all the noise in the market, and take a look at it after five years to see if you're satisfied with it. You'll have learned a lot about how the markets work." "Anybody can do it," Bogle said. But saving for retirement requires commitment. "It's simple but it's not easy," he said, saying he'd heard many wise people use that expression -- among them Cliff Asness and Warren Buffett. And in last week's talk and panel discussion, Bogle recommended that investors keep a laser focus on investing fees. "Dividends matter. Dividends are the most important things around," Bogle said, talking about those from both stocks and bonds. But "we eat up all of our dividends with stock expenses" when gross yield on domestic stocks is 1.9%, but the average mutual fund expense ratio is 1.2%. That leaves only 0.7% in net yield to compound, as 63% of dividend income goes to the managing company. Investors need to seek out low fees in order to benefit from long-term compounding. Bogle also advised against get-rich quick schemes or big bets in the market. "This is a risky world we live in, and I don't know what to do about it except a reasonable conservative position." He called for a balanced position in stocks and bonds, without going overboard into international stocks. Needless to say, Bogle is a fan of Vanguard, the company he founded, and its low-cost index funds. (The Vanguard 500 Index Fund (VFINX - Get Report) (VFIAX - Get Report) (VOO - Get Report) was the first index fund available, and it's what Berkshire Hathaway's (BRK.A - Get Report) (BRK.B - Get Report) Warren Buffett has chosen as the fund to hold 90% of his wife's future inheritance.) "With the index, you capture your fair share," he said. "Own the stock market and hold it forever," Bogle declared. No jumping around. "The problem we all face -- that's behavioral risk," or the risk that people will panic in a down market or lose their heads in a good one. So keep calm and stick to your plan. Bogle also commented that the fear over baby boomer retirement is overblown. What market impact will it have? "I'll take an extreme position. Nothing. None," he said, laughing. Gus Sauter, former chief investment officer at Vanguard, retired in 2012 after overseeing $1.5 trillion in stocks, bonds, cash and other assets. In a talk at the Bogleheads meeting on Friday, Sauter agreed with Bogle on many points, especially about how difficult it is to beat the market. He quoted Yogi Berra: "It's tough to make predictions, especially about the future." Sauter advised against betting against the market. "You may be one of the lucky ones... but the odds are probably stacked against you." The market is a zero-sum game; there's always a buyer for every seller. What if the buyer knows more than you do? Terms like "smart beta" (which Bogle also dismissed) reminded Sauter of Samuel Johnson, the British writer, he said. These new ways to find an edge on the market are "the triumph of hope over experience," as Dr. Johnson once said of second marriages. Gaming the system doesn't usually work, he said. Sauter also said that "all the uproar about high-frequency trading sells books," but shouldn't derail people from saving and investing. Mel Lindauer, one of the founders of the Vanguard-themed forum and co-author of The Bogleheads' Guide to Investing and The Bogleheads' Guide to Retirement Planning, said in an interview that he learned about investing the hard way. "I made every mistake you could make," he said -- even paying 50% commissions at one point. "I did learn dollar-cost averaging," though, he said, referring to the technique of gradually buying securities over time. Late starters "need to start saving," Lindauer said. "Or they should consider working longer or cutting back. That's the advantage of starting early." Don't give up hope, he said: "It's better to start today than tomorrow or the next day. It's never too late." A conference attendee approached Lindauer for an autograph of his book. The fan told him that the Bogleheads books had saved his financial life. "That's really heady stuff," Lindauer answered. "I hear about how people were able to retire early and pay for their kids to go to college." He seemed to think his mistakes were worth it. Rick Ferri, the founder and CEO of Portfolio Solutions, has written six books on investing, including The ETF Book and Serious Money: Straight Talk About Investing for Retirement. He's also a co-author on one of the Bogleheads books -- and a former fighter pilot and Wall Street adviser. Ferri said in an interview that "investing starts with a savings plan first." Late starters should target saving "probably 20% [of your income]; if you start earlier it's more like 10%." Then "the question becomes how should you invest this money. That's based on two things. One, what rate of return do you need to get to get to your goal. And two, can you handle the risk. If you can't handle the risk, you're doing yourself a disservice," he said. If you are risk averse, you'll need to hold more bonds to avoid market swings. "Now you're at your asset allocation on the stock side and the bond side," he continued. "Indexing in the long term is low cost and should perform better. Then, what kind of index funds? Generally 70% to US equities and 30% to international. And Total Bond Market. You only need three funds." "It sounds like,' Wow! There's all this stuff I gotta do!'" he said. "I say, go to Vanguard.com and start reading -- and don't do anything for a month." He added that "indexing is the best thing for most investors." "You need a plan. You can't put the cart before the horse. You've got to start at the beginning and work your way through it. People jump way ahead because they read something." But they should wait before diving in. "It's simple but not easy," he said of investing for retirement, using the same description Bogle used in a separate interview. Market swerves are scary, but investors need to be patient. Allan Roth, a financial planner in Colorado Springs with WealthLogic, offered simple advice in an interview. With saving and investing, "It's like 'I know I need to eat better but I don't,'" he said. "Investing is minimizing expenses and emotions, maximizing savings and investing, diversification and discipline," Roth said. "And don't panic. Dare to be dull." Christine Benz, the director of personal finance at Morningstar (MORN - Get Report) , said in a panel discussion that it isn't just investors who make big mistakes -- it's advisers and institutions as well. To avoid those mistakes, she supports the "enforced discipline" of maintaining your stock-to-bond ratio in both down and up markets. In a panel discussion, Mike Piper of the Oblivious Investor Web site and a CPA, said, "Just stick to a plan, whatever plan you come up with." Investors should also try to avoid all the taxes they can by investing in IRAs and 401(k)s, he said. Although he's a Ph.D. in chemistry with an M.D., plus author of six books on investing and capital markets, Bill Bernstein gave simple advice in an interview: "Save as much as you can and don't stop doing that until you die!" "Live below your means," advised Gail Cox, a volunteer Bogleheads coordinator, on how to start out toward retirement. "Save as much as you can without compromising a fun quality of life. You've got to have fun, right? And get your debt paid off. If you can stick with that you're ahead of the game," she said in an interview. Cox said, "The catalyst for me was one day I woke up and wondered: how am I going to retire? Just pick up a book and start reading. I like the Dummies books." Eric Haban is a journeyman machinist who began posting on the Vanguard Morningstar forum at age 19, in 2001. Sporting a new Vanguard hat, he said in an interview at the Vanguard campus, "I would strongly recommend that any new investor use the KISS method. 'Keep it simple, stupid.' Pick a balanced fund, a target-date retirement fund or a life strategy fund." How did Haban first get together the money to invest? "In high school I had a wood-carving business and worked part time as an apprentice," he said. And he took his grandmother's advice: "It's not what you make, it's what you do with what you make." Haban insisted that starting to save as early as possible is key. Albert Einstein "said that compound interest is the eighth wonder of the world," he quoted. And delaying spending and gratification will mean retirement will be possible even for those who are far from Social Security age. "Live below your means and build a nest egg," he advised. "It's certainly not easy with today's incomes and a weak job market." But it's the only way, he said. Nora Morrison is an editor, writer and researcher on music, popular culture and business. She is an associate editor at TheStreet, and is on Twitter at No Ticker.